Manja had not been my favourite stop over. It rained just before our arrival and we were the last car to squeeze into the car park compound. I thought about the challenge of getting out with a flat battery in the morning. The accommodation was a long way from the very comfortable accommodation from previous nights. Yes, John and I each had our private suite with bathroom and toilet but we were warned that the electricity could go off any moment. There was a huge cockroach on the bedroom wall and I tried to whack it with my trainer, still soaked from yesterday’s boat ride. The wall appeared to consist of reed that moved as the cockroach got my size 11, which did not seem to have any affect. The camp consisted of rows of chalets, each separated by paper thin walls, so you could enjoy the sound of farting coach parties all round. It reminded me of the scenes of a Vietnamese war film that I had seen in the seventies. Still, my Martini Sleeper reputation – ‘Anytime, Anyplace, Anywhere’ is still in tact as I turned on to my good ear and shut the world outside of my mosquito net out of my mind. No sooner had I made myself comfortable or the power was cut. Around 3 a.m.my bladder demanded emptying so I switched on my laptop and by the light of the screen found my way past the giant cockroach and once back in the safety of the mosquito net was soon off to sleep again. The car answered our prayers and fired up at first request. I was glad to leave Manja behind. We had to cross another river and while waiting, were able to observe at least three cars from previous crossings, stuck in the soft sand on the opposite shore. Soft wet sand was again the problem and the more that the cars tried to get out, each with its crowd of passengers, advisors and helpers, the more the sand became disturbed. Christophe and I watched another car leave the ferry, made a brave attempt at full speed, but then slowed down to rubber-neck at the first car, stuck to over its axels in the sand and it too joined the victims. One of the locals on the ferry confirmed our opinion to stick the car in 4×4 mode, get into 2nd gear and keep a steady speed – not slowing down. Do you know the best path through? Of course, for 5,000 ariary (less than £1.25) he would take us through. Done! And he was as good as his word, as we passed the stranded vehicles who would probably struggle for a few more hours to get out. The other highlight of the day was a visit to what is alleged to be the oldest Baobab tree in Madagascar. We found a fony baobab (Adansonia rubrostipa) called La grand-mère (the Grandmother) that researchers found consists of three perfectly fused stems of different ages. The radiocarbon date of the oldest sample was found to be 1136 ± 16 BP. The study also revealed that the trees are mostly hollow. 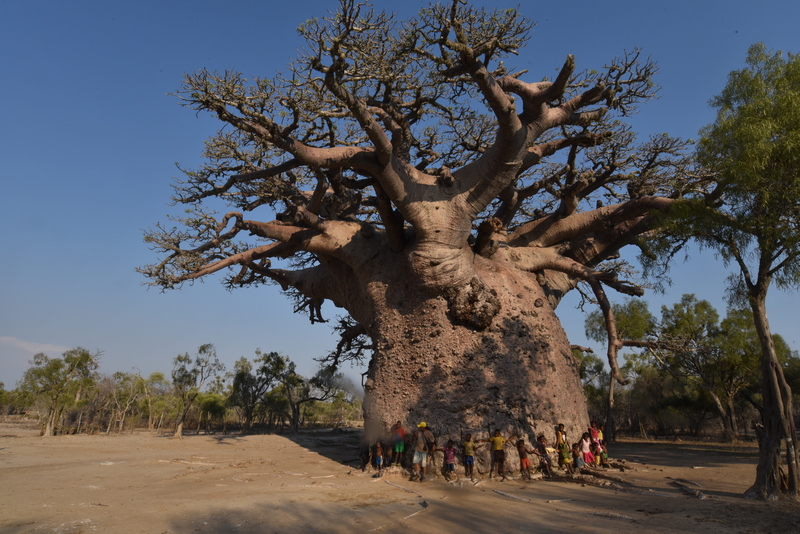 (see Searching for the Oldest Baobab of Madagascar: Radiocarbon Investigation of Large Adansonia rubrostipa Trees by Adrian Patrut, Karl F. von Reden, Pascal Danthu, Jean-Michel Leong Pock-Tsy, Roxana T. Patrut, Daniel A. Lowy). But how big is it? We took turns to have our pictures taken for scale, but we felt tiny and insignificant. Most of the village had followed us out, after we had paid the fee to access the tree, so I asked Nadia to ask the lady who seemed to be ‘in charge’, to ask all the kids to hold hands to try to get all round the tree. They managed to get only half way! They had negotiated a participation fee of 10,000 ariary for their posing! Better than bonbons! It has a height of 7.47 m and a circumference at breast height (cbh) of 9.67 m. Too big for my collection! I asked Christophe about the apparent lack of seedling plants. He explained that there was no simple answer, as seedlings are very hard to ID. More later. There were certainly plenty of fruits with plenty of seed. I remember many conversations around camp fires in the Chilean Atacama Desert about the possible age of the huge clumps of Copiapoa. Memories of conclusions are usually coloured by the quantities of red wine consumed at such discussions.